I’m repeating myself from almost exactly one year ago. Last October, I made a pumpkin flan, and this year, I’ve made one with persimmons. It couldn’t be helped. There was a big table of persimmons at the farmers’ market, and I had to bring some home. Then, I found this recipe for persimmon flan in Potager which is a book devoted to cooking seasonally. I think of flan in the same way I think of souffles. They both seem a little daunting because it seems like things could go horribly wrong, but in the end, they’re actually very easy and almost never fail. The persimmons were peeled, seeded, chopped, and briefly cooked before being pureed. The puree was pushed through a strainer to make it very smooth. Although the recipe was very straightforward in that just plain persimmon puree was to be added, I had to introduce a little something extra. To the puree, I added a pinch or two of nutmeg and cinnamon. As usual for flan, sugar was caramelized in a small cake pan and then set aside. The custard was made from six eggs, milk, cream, sugar, vanilla, and a bit of salt. The persimmon puree was stirred into the custard, and the custard was poured onto the caramelized sugar in the cake pan. It was baked at 325 degrees F in a bain-marie with water coming halfway up the side of the cake pan. The recipe noted it should bake for about 45 minutes, but mine required a few more minutes before it was set in the middle. The flan was removed from the roasting pan with water and left to cool on a rack, and then it was unmolded onto a plate. That’s the scary part, but just like last time, it popped out without any problems. The remaining caramel in the pan was then pooled onto the inverted flan. I have to admit the caramel is the real reason I like flan so much, but the custard was delicious too. The persimmon flavor was mild, but by adding fruit, the custard is prevented from tasting too much of egg. Next time, I might add a larger pinch of cinnamon, but I’m not complaining about the results here at all. I should really consider making flan more often than once each October, but at this rate, it has been a special, appreciated dessert each time. I've never tried putting flavors on teh flans I make..thsi is a great idea..
Never had anything like this. I've always had the traditional flan. i like the added flavor to it. Definitely kicks it up a notch. I actually had some flan earlier today, but it didn't compare to yours. I've only had flan once and I didn't care for it, but I really need to give it another chance. I do love the idea of a persimmon flan! Wow, the color is beautiful. I love the idea of using persimmon, I never know what to do with them except make cookies! That is a lovely fruit! This flan looks delightful! Your flan looks so good & apart too!! Lisa, this is one terrific dessert!!! Yummie!! I love all kinds of flan, yours looks terrific! I haven't had persimmons in years! We used to go persimmon hunting when I was a little girl & we'd eat them until we were sick, LOL! This sounds so lovely and I'd love to try it someday. It's definitely a keeper! oh yum, no worries, repetition of your kind is a very good thing. 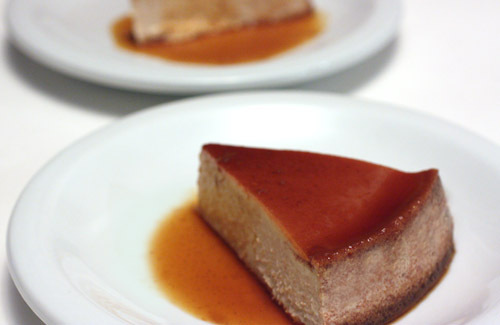 This flan looks amazing and I love persimmons. What a treat, and like pumpkin they speak of fall to me. super fancy. we don't seem to get good persimmons but I know this would be wonderful. Your flan is absolutely perfect! I like the sound of the persimmons in it - so different but so delicious! This flan is so impressive! I love persimmons but I've never baked with them. Very nice! Persimmons was one of my favorite fruits when I was a kid. I wonder why I never thought about making anything with it. I always just peel it and and eat it. Lisa, I love persimmons they are just beginning to show up in the farmer's market. This flan looks awesome! I might just try it next time I get my fresh bounty. Flans are delicious- but I've never had a persimmon one. Great idea! The color is even deeper than a regular flan. So I'm guessing you have to use the persimmons that get squishy soft, as opposed to the squat ones that you can enjoy hard and crisp? How inventive this flan is. Never seen anything like this with persimmon before. I love fuyu persimmon, never really cook it, but it sounds really tempting. 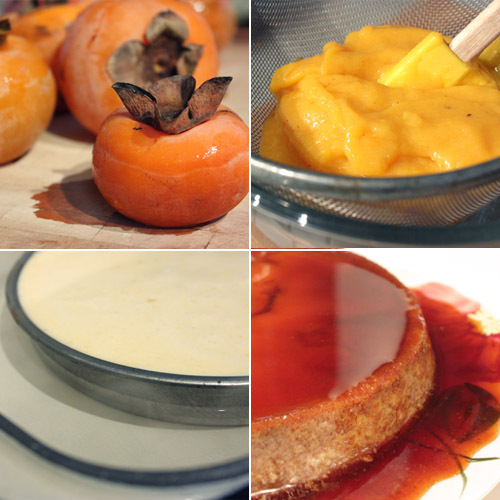 Persimmon is one of my fave fall fruits, but I had no idea you could make it into flan! Holy goodness, this is fabulous! Sure beats pumpkin pie! GORGEOUS...just so gorgeous. Love the colour & am now looking at my 2 fuyus that are yet to ripen. Should I venture out? How many eggs in there Lisa? You are really tempting me now, and we have tonnes of fuyus & hachiyas in the market these days! Now that's one fruit I have not put in a flan. Looks so good, Lisa. What a unique flan! Must be so delicious with persimmons! Very interesting, I always eat fresh persimmons fresh and have never cooked it. Looks and sounds delicious. all i can do now is stare at this beauty & crave some. Flan is one of my favorite dessert. 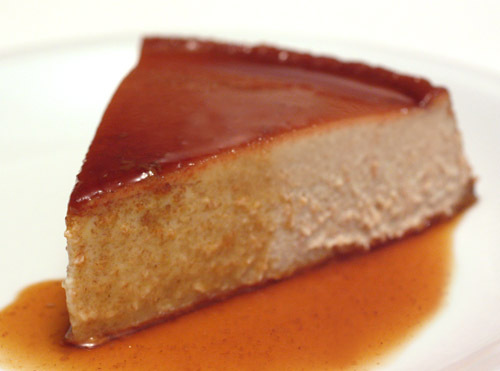 Your flan looks perfect - look at that glossy top and the creaminess of the single slice! Cheers for future October flans that come out as lovely as this one.